Purchase a signed copy directly from Starsys Publishing Company from this page. You'll have the opportunity to provide special instructions during checkout. Posted on Amazon.com by alejandra o. 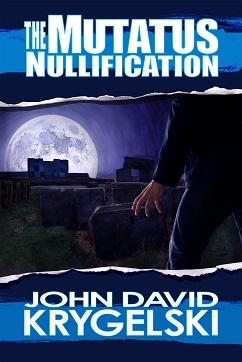 Posted on Amazon.com by K. Nolan "Music Doc"
The Mutatus Nullification is the astounding conclusion to one of the most critically acclaimed stories from the fervid imagination of John David Krygelski – The Mutatus Procedure. Judtson, Kelsey, and their eclectic group of formerly mind-altered misfits, believing they had defeated the devious plot to seize control of the global power structure, are stunned to discover how horribly wrong they were. Thrust together once again, they are plunged into a tangled web of deceit, intrigue, subterfuge, and betrayal, uncovering clues leading them to an answer they never dreamed possible...an answer to a question thousands of years old, linking the seemingly unrelated Roswell crash, the Masons, monoatomic gold, the Illuminati, the Knights Templar, and the ancient civilization of Sumer. Hold on to your seat. This story will take you where your mind has never been before!